Wrenchtech Garage rule # 1: Don't pay retail for steel (or anything else for that matter)! 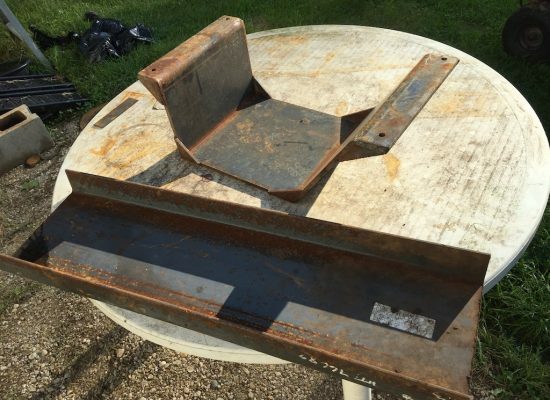 Here are a couple of pieces of steel that I picked up at my local recycling center. If I had purchased this quantity of steel at a retail steel supply business it would’ve cost more than $200! I paid about $5 for the pieces you see in the picture. One of the pieces is a fabricated part for a piece of agricultural equipment that is made up of 3/8 inch steel. The other is a piece of channel about 3 feet long and 10 inches wide that will give me a nice piece of quarter inch flat steel to work with. I need the 3/8 inch steel for some brackets that I am making for a disc brake conversion project that I’ve got going. Wrenchtech Garage rule #2: Get what you need from the waste stream. Riches are there waiting to be claimed by enterprising. Especially in the United States, where we throw away our possessions almost as fast as we acquire them. For people who have the skills and tools the waste stream is a gold mine. *As a matter of full disclosure, if you purchase any products through links on these pages I stand to earn a small commission. I rely on this kind of income to keep the lights on and to keep the reviews coming. I am first and foremost a DIY enthusiast who loves wrenchin’ on cars and bikes, and making custom tools and shop equipment. I like to review products that are helpful to that end. I did not receive any free merchandise or other payments to influence my selection of products or my opinions about those products. Metalworking has some element of risk. Always consider safety when undertaking a project. Proper safety gear is a must, including personal safety gear like eye and face protection, gloves, sturdy shoes and long sleeve shirts. Always consider the possibility that you could start a fire while welding and keep a fire extinguisher handy.